Should I Install A Whole Home Dehumidifier in my Chicago Home? With record setting rainfall hitting the Chicago area this summer, you can expect some damp spaces in your home this season. This is especially true if you have experienced the misfortune of having a flooded basement. Whether you are trying to maintain comfortable humidity levels throughout your home, or you are in need of a permanent mold remediation solution, a whole home dehumidifier is the perfect solution. Many homeowners in Chicago that are experiencing a moisture problem often go for the quick fix. This quick fix usually involves a trip to Home Depot, Menards, or Costco to pick up a portable dehumidifier. While it may seem like the easy choice, these small portable dehumidifiers have a problem. If you are trying to regulate the moisture in a large basement, or an entire home, they are simply too small. This requires them having to be moved around and emptied throughout the day. With a whole home dehumidifier from Aprilaire, the unit is installed next to your current HVAC setup. It never has to be moved. Also, it is connected to your drain so you will never have to empty it. 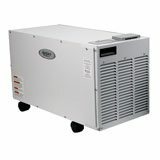 While installing a whole house dehumidifier is more expensive than purchasing a portable unit, it is a permanent solution. Another drawback to portable units is that they really don’t last long. You can usually expect to replace it every couple of years which ultimately can cost you more than a whole home unit. Protect Furniture, Floors and other items from warping, rotting, and becoming damaged by mold. Improve the indoor air quality of your home. Reduces mold, allergens, mildew, and dust mites. Increased comfort by eliminating mildew odors, damp and sticky air. For a Free Estimate on Whole House Dehumidifier from Aprilaire, contact the indoor air quality experts at Polar Heating and Air Conditioning today!